Think about the best business meeting you attended, or the best party. What made it so terrific? Chances are, the food played a huge role in making that experience a wonderful one. The way food is displayed is just as important as how it tastes. People eat with their eyes. Whatever you are serving has to be visually enticing. Select Sandwich takes great care in how we present our food on our platters. 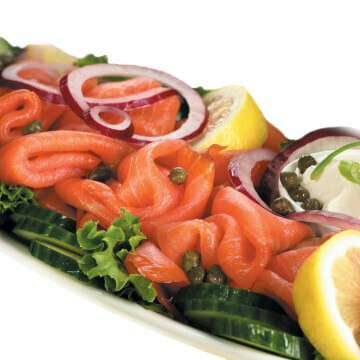 Take our platter of premium smoked salmon, for example (my personal fave!). The fresh capers, juicy lemon, and crisp cucumbers that accompany the salmon give the platter a vibrant, fragrant boost that captures everyone attention. If you are catering a breakfast event, you might also want to consider our Rise and Shine Platter, featuring fresh assorted bagels, sweet pastries and moist muffins, the Breakfast Bagel Platter loaded with fresh assorted cheeses and bagels, or the Breakfast Omelette Wrap Platter that boasts a variety of warm and fresh omelettes rolled in spinach, sundried tomato and wholewheat wraps. The platters don’t end there! Our paninis, wraps and sandwiches are superior to all others! Artisan breads, hand-picked pickles, fresh veggies and perfect sauces provide your guests with everything they are looking for. You might want to add a hot, delicious soup for those meetings on cold winter days! Make sure to also check out the exciting entree platters that we have available! Lasagna, quiche, and a variety of beef and chicken dishes are just a few of our popular platters that help make your event or meeting the one that everyone is talking about. Whether you’re hosting a breakfast, lunch or dinner event, remember to treat your guests to one of our sweet platters- fresh cut fruit, or delicious desserts– your guests will leave with full bellies and smiles on their faces.